Martin George joined Leicester Law School in September 2014. His primary research and teaching interests lie in land law and property law theory more generally. After studying at the Universities of Leicester and Nottingham, Martin was a College Lecturer at Hertford College, Oxford before taking up the Lectureship in Land Law at the University of Birmingham from 2009-14. He was awarded the Excellence in Teaching Prize 2013 at Birmingham, and has been voted Lecturer of the Year in 2015, 2016, 2018 and 2019 by the second-year law students at Leicester. 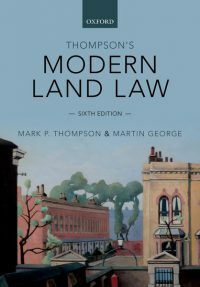 Martin is the co-author, with Emeritus Professor Mark Thompson, of the sixth edition of Thompson's Modern Land Law (Oxford University Press), which was published in July 2017. In November 2017, Martin was elected as an Academic Fellow of the Honourable Society of the Inner Temple. He is also an Associate Member of 4 - 5 Gray's Inn Square, a leading commercial law chambers. At Leicester Law School, Martin is the Senior Tutor, as well as the Senior Admissions Tutor for the College of Social Sciences, Arts & Humanities at the University of Leicester. He is a Fellow of the Higher Education Academy. Martin would be happy to hear from prospective doctoral candidates in any of his fields of interest, and particularly property law and theory. He is currently supervising Victoria Ball, who is writing her PhD on 'Protecting Property through Torts'. Vicki started in October 2016, and has a full Graduate Teaching Assistantship grant.